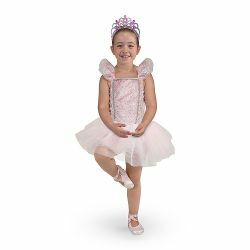 With this five-piece ballerina dress-up costume, it's easy for aspiring dancers to dress up like prima ballerinas and imagine themselves on stage! A pretty pink bodice and tulle tutu, crushed-velvet bloomers, ribboned slippers and a glittering tiara have all the glamour of a recital costume, but are easy for kids to put on and take off all by themselves. The bloomers, top and shoes are washable and durably constructed to last through years of imaginative play!